Looking for the best ukulele for kids? Music is an important part of life, so much so that unless you’re sitting alone in a quiet dark room, you probably hear some form of music throughout your day. It’s so common that you might not even realize you’re hearing it. Music sets the mood for everything we do. In the car it helps us get through rush-hour traffic, in the mall it makes shopping for jeans less stressful, we remember those TV commercials with their silly jingles, and when we’re in the waiting room at the doctor’s office the music helps us to relax. Babies learn about music in the womb, and although they don’t understand what it is, you might feel them dancing and swimming around in there. If you ever notice, sometimes a baby will react to a song they heard while they were in the womb because they recognize it later, and if you’ve ever seen a toddler smile and dance with a fun song on the radio, you know how important the music is. If your toddler finds interest in a wooden spoon and a pot, don’t condone it, they are learning about a valuable part of life known as the world of music. This will be the beginning of their future endeavors because they will eventually retire the wooden spoon and ask for the real thing. Although there are many instruments your kids can learn to play, the ukulele is one of the best ones for them to get started with. A ukulele is small enough to fit into the hands of a five-year-old, it only has four strings, it’s easy to learn, and most importantly it is an inexpensive instrument, so if they lose interest it won’t hurt your pocketbook as bad as some other instruments could do. Now, you probably are asking what is the best ukulele for kids and how do I choose the best one? Well, no need for worry because we’ve got you covered. In this guide, you will learn when you should start considering the instrument, what to look for in the ukulele, and we have even made a list of our top five choices. When you’re finished you should have no problems making your decision. How Do I Know When My Child is Ready for a Ukulele? When your child begins to show an interest in an instrument, pay close attention to their actions. Maybe they will play the air guitar or use anything they can get their hands on to play out a rhythm. Watch music videos with them and talk to them about the various instruments, the sounds they make, and the role of the instrument in the band. If they express interest in learning to play an instrument you can then introduce them to a ukulele. A child as early as five can start learning to play the instrument, although there have been children younger that have successfully learned to play as well. 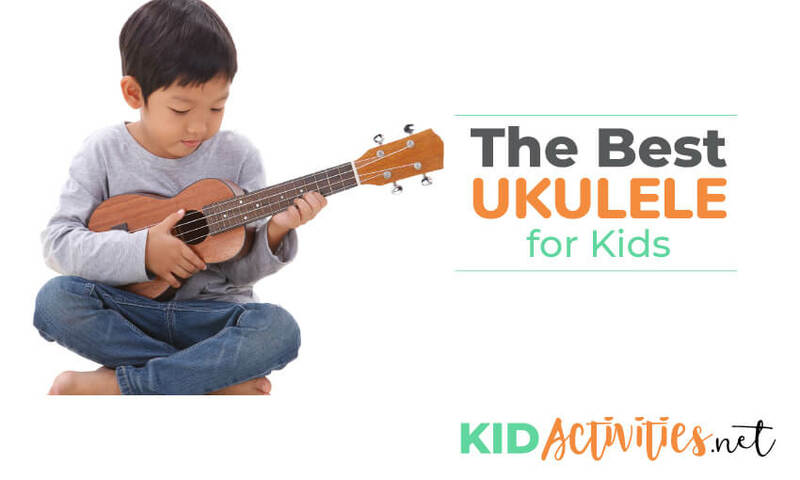 Consider watching videos online of other children playing the ukulele and you can make a trip to the music store to see just how your child reacts when they hold it in their hand. What Should I Look for in the Best Ukulele for Kids? The first thing you should know about choosing the best ukulele is that you should steer clear from the toys. They are made of plastic, with cheap strings, they sound like a toy, and the chances are slim that your little one will keep an interest in the instrument. Choosing a real one won’t hurt your wallet, and chances are that you will find one just a bit more in cost than that toy one you were thinking about. A real one is made of better quality; constructed of wood and nylon strings. They have real tuning pegs, much like you would find on a guitar, and they sound like a real instrument as opposed to a toy, so you will be sure to have their attention focused on learning the instrument. Soprano- This one is the smallest at 21-inches and it is the best for beginners and children. The sound is a bit softer and not as overbearing as the others making it more pleasant to the ear when they are learning. Concert- This one is 23-inches, just a tad larger than the soprano, so it might be harder for a five-year-old to hold onto in the beginning. The sound is deeper and more protruding than the soprano. Tenor- At 26-inches, this one is better for those children who have been playing for a while. The sound is much deeper than the first two and the fingerboard is larger, so it’s easier to play chords. Baritone- This ukulele is the largest of them all. At 30-inches you can see why this one wouldn’t be the best for a beginner. The sound is similar to that of a guitar. This is the best ukulele for kids who want to play the guitar in their future. Remember that the better the wood, the better the quality, don’t forget about the size and if you can find one that includes extras like a gig bag and a tuner that’s an even bigger bonus. The following list is compiled of five of the best ukuleles for kids that you should consider before making your final decision. Made of high-quality wood, attractive colors, and enough extras to get your child started, this is the best ukulele for kids offered at the lowest price on the list. Honsing presents an attractive soprano ukulele made of a durable basswood body complimented with a maple bridge and fretboard. This ukulele features open tuning pegs across the top resembling a guitar and the nylon strings are made of a higher quality than you would expect from a ukulele in this price range. It is offered in an array of attractive colors and styles that will please everyone in any age group and the gig bag makes it perfect to carry the instrument to class or keep it protected in the closet. You already know the features on this ukulele are better than you would expect, but what about the rest of the instrument? 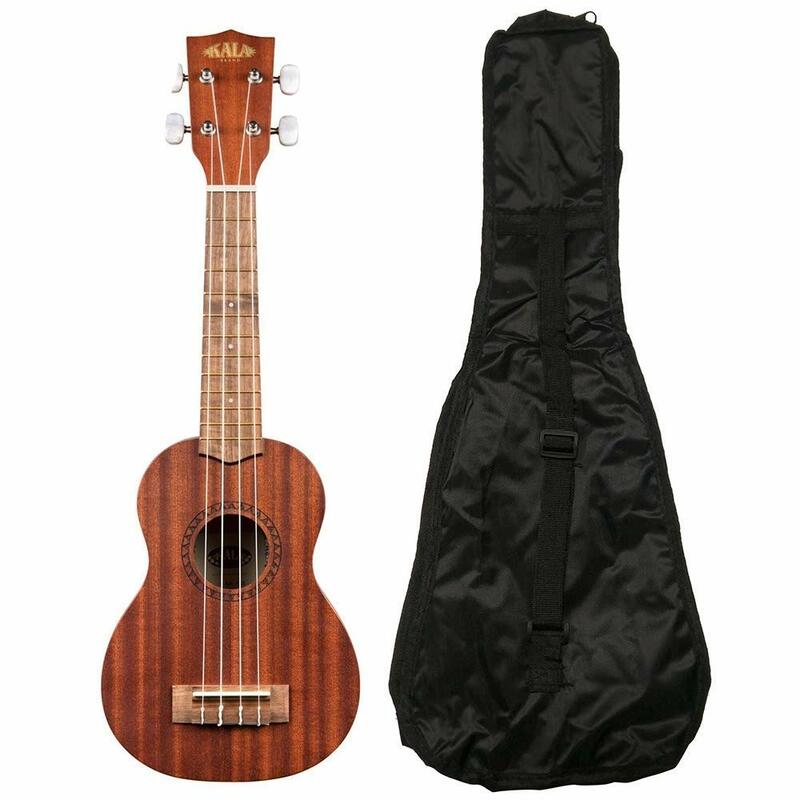 It’s the perfect size for little hands, the colors and design are attractive to the younger crowd, and although some say the sound might be a little tinny at times, and the bag might be made of a cheaper quality, it’s still one of the best ukuleles for kids on the market. For all that is offered here at this remarkable price, it’s the best way to get your little one started toward a future in music. If your pre-teen or teenager wants to learn to play the ukulele, this is the best choice for them. It offers everything a beginner to intermediate could want in a quality instrument. This soprano ukulele offers an eccentric design with dolphins swimming across the top of the natural wood surface. Made of basswood, this ukulele is designed with twelve frets and position marks that make learning easy and fun. The strings are made of high-quality standards and with this, you won’t just get the instrument, but you will also get a gig bag, a digital tuner that will easily clip on, a neck strap, and an extra package of strings. It even comes with a thirty-day guarantee! This ukulele is definitely not a toy! It’s made with top-quality materials and it sounds great too! The design is perfect for young kids and teens, and it comes with everything necessary to play some serious music. It’s designed for easy learning and it’s simple to hold. It doesn’t come with instructions, but you can find many learning resources across the web. This comes with great ratings and a remarkable price. This great looking soprano ukulele is ideal for both beginners and experienced players alike. It’s not only perfect for kids, but anyone at any age will enjoy learning on this one. Kala is known for quality and durability and this ukulele is no exception. The body and neck are both constructed of the highest-quality mahogany while the fingerboard is made of walnut. The neck houses twelve high-quality brass frets along with additional fret positions located on the fifth, seventh, and tenth frets which make this an exceptional ukulele to learn on. This attractive ukulele is strung with nylon Aquila strings and the look is completed with a satin finish for a classy look. Not only does the name of this ukulele prove it’s one of the best but wait until you hear the rich sound it produces. You can tell this one is designed for players of all levels and the design will please everyone of all ages. Although it doesn’t come with all the extras, it does come with a gig bag that will fit perfectly over the shoulder of your young virtuoso. This one is perfect for all ages and every level of expertise. Not only does it come with a bundle of extras, but it’s also offered in a variety of colors. Constructed of mahogany and spruce, this is one of the best high-quality, entry-level soprano ukuleles made by Kala. It features quality Aquila strings and geared tuners with a custom bridge and a rosewood fingerboard. 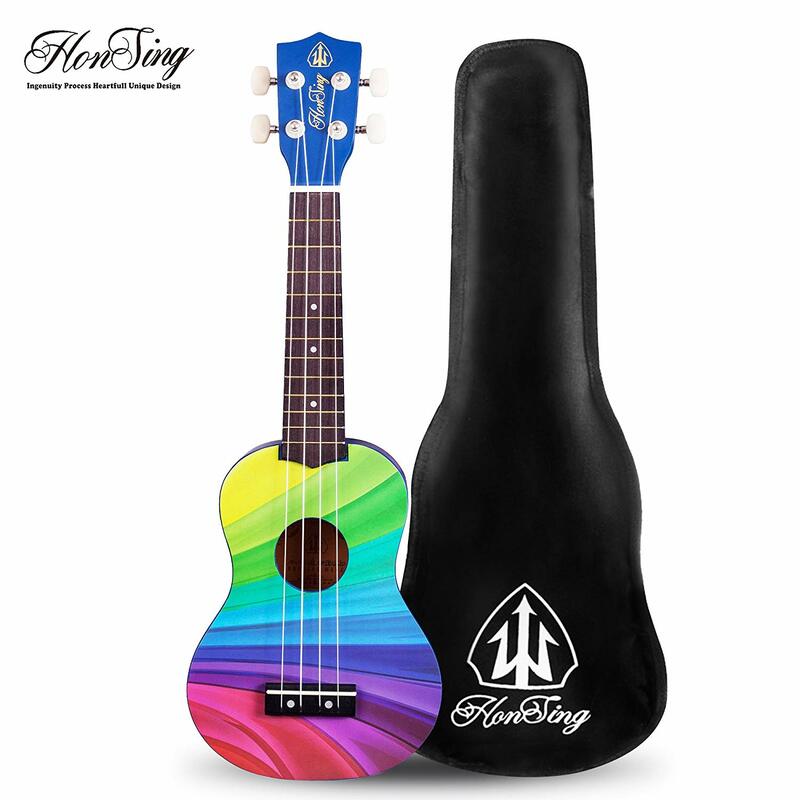 This ukulele features a variety of colors that are appealing to both male and female and they all feature a shark that is strategically placed on the front. 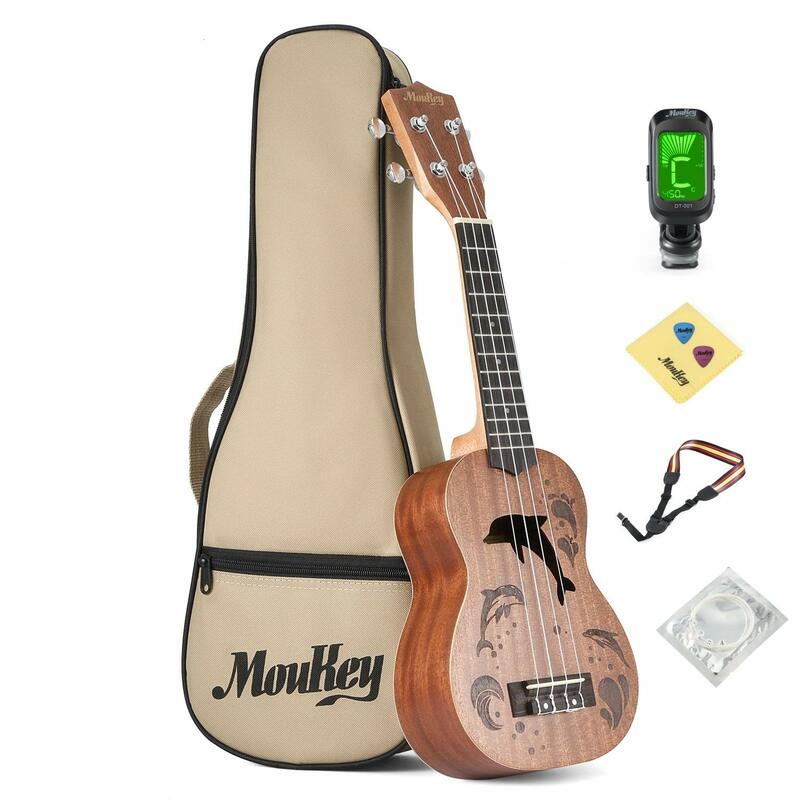 Not only are you getting a great ukulele, but you will also get a good quality gig bag, a clip-on digital tuner, a polishing cloth, and an Austin Bazaar DVD. 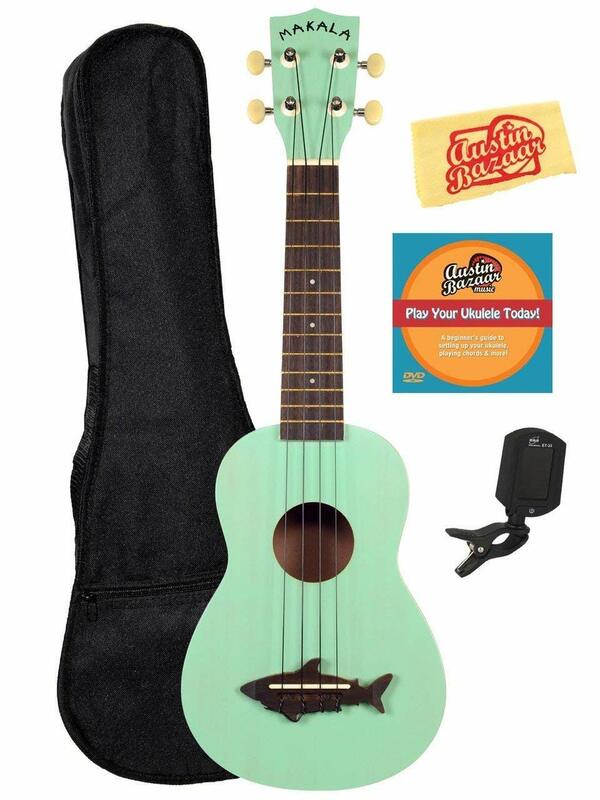 This bundle includes everything you will need to get started, and although there is no button on this ukulele for a neck strap, one can easily be added. You’ve already learned that Kala makes a great instrument, and with this ukulele, you are getting the best of all worlds. It’s designed to please both male and female, it is great for all ages, anyone can play the instrument, and it comes with all the great accessories that are needed to perform with perfection. If all that isn’t enough, the high rating and excellent price should prove why this is one of the best ukuleles for kids. Although this ukulele is designed with children in mind, it is ideal for advanced players of all ages. The stunning mahogany design shows off the top of the line quality and features of this concert ukulele. The body of this one is twenty-three-inches, that’s a bit larger than the others on our list, but it is a concert ukulele and is intended for the more seasoned player. It is also heavier than most, but it is handled well by younger kids. It produces a crisp sound leaving no buzzing strings behind. It’s incredibly durable, so you won’t have the worry of your youngster breaking or cracking it easily and the open tuners make it easy to adjust in the middle of a concert. This top of the line ukulele is complete with eighteen frets and heavy strings. We’ve already told you that this one is top of the line, and although it is also at the top of the price range, it is the best in the line of the concert ukulele, and you won’t be disappointed with its performance. Even though it doesn’t come with anything other than the gig bag, at this point, your child probably has all the extras anyway, but it does come in three different wood choices and the engraved design is a pleasure on the eyes. Everything your youngster needs in a concert ukulele is wrapped up in this one. By now you probably know which ukulele you want to purchase for your youngster, so now all you have left to do is teach them how to play. You can find a wide selection of instructional material across the web. You might also consider checking in your area for a teacher who comes highly recommended. No matter how your child learns to play, it will all start with the best instrument and a lot of support and encouragement from you. There you have it, the best ukulele for kids. Hopefully you have found one that will be the perfect fit for your child.